In two hours volunteers will measure, weigh, seal, and package over 10,000 meals of rice, vitamins and protein for distribution to impoverished countries and areas affected by disasters. 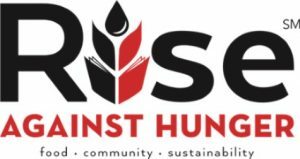 Sign up to help pack meals or make a donation at our Rise Against Hunger RUMC Page. This is a fun, family-friendly, hands-on volunteer event that provides everyone who participates with a sense of accomplishment. This entry was posted in Events, Missions, Volunteer Opportunity, Youth and tagged family friendly, meal packing event, rise against hunger, stop hunger now, volunteer opportunity by Diane Lajoie. Bookmark the permalink.